Sharing a warm cup of coffee or a pastry is that rare communal activity that transcends culture and experience. 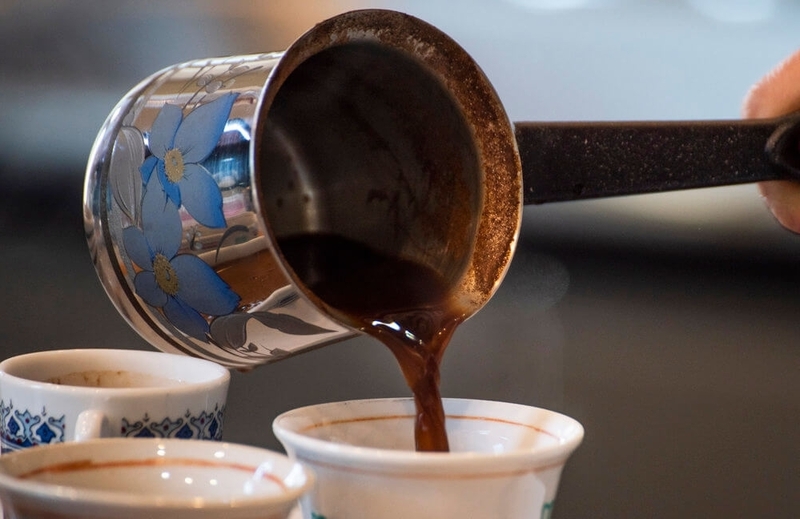 Melissa Aydogan is fostering this universal activity at Rüya, her Turkish pop-up coffeehouse, which is bringing the centuries-old Turkish coffee tradition to Cincinnati for the first time. Besides the coffee, Rüya will host events, performances, and discussions from creatives across all cultures defying the odds in America. We will be open from September 7th through November 18th. 1805 Elm Street, Cincinnati, Ohio. The phrase Turkish Coffee refers to the brewing method, not the beans used. Finely-ground coffee is briefly boiled in a long-handled copper called an ibrik. The coffee is immediately poured into a small cup - resulting in a thick, textured brew. It is dark, unfiltered, and one of the most distinct coffees you'll ever taste! Some products contain or were produced in facilities that process dairy, wheat, nuts and/or nut Products, inquire if you have Food Allergies. Our online shop is still being set up so stay tuned! RÜYA Turkish Coffee Dark Chocolate by Maverick Chocolate Co.
See our full Event Calendar for all of our events! Interested in hosting your event with Rüya? We host weekly events during the evening. Check our Event Calendar for more information. If you can't make it to the store in person, our products can also be purchased online. Check out our online store. We are also working with local delivery services in the Greater Cincinnati Area to bring our products right to your home. We would like to give a special thanks to our partners! Spectacular view of colorful hot air balloons flying high in Cappadocia, Turkey. Cappadocia is a famous vacation destination for its panoramic desert views and cave homes. Turkish national flag waving in the wind by Istanbul, Turkey on the Bosphorus. Bright yellow tulips in front of historic landmark Hagia Sophia in Istanbul, Turkey. Beautiful stained glass lanterns hanging in a Turkish bazaar.